This is the most pulsating, precise and livewire chardonnay we have ever grown, vinified and bottled. Pretty much the antithesis of soft, fat Californian chardonnay. A pulsating wine that gradually builds in the glass to a powerhouse of mineral drive, deep intensity and ultimately broad, mouth filling weight. It’s a pretty remarkable mouthful. 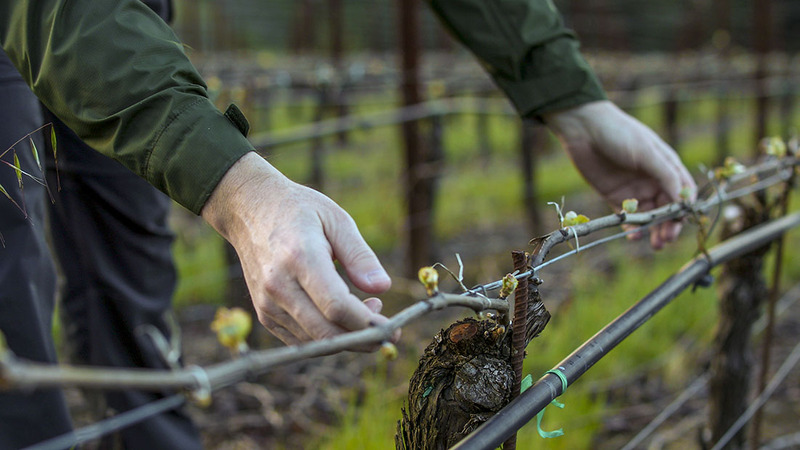 Quality like this only comes from old vine selections planted in shallow soils with farming that is precise yet natural, non-invasive and driven by listening to the needs of the vine, not a formulaic one-size-fits-all approach. These Estate vines are beginning to reach maturity so we’re seeing them settle into a uniform growth pattern that requires minimal intervention. They are in near perfect equilibrium with their environment and this translates to great quality in the bottle. If a wine’s overall length, and the manner in which it expands and fans out on the finish, is its ultimate measure of quality, our 2013 Estate Chardonnay is at the top of the pack. Important to decant this prior to serving. Straw-colored in the glass. Grand scale aromatic complexity: green herbs, ginger, hay and fennel. Then the fruit takes holds, melon, Gravenstein apple, lime zest and honeysuckle. Piercing vibrant palate, extremely saline and savory. Lanolin, almondy texture builds. Deeply focused clarity and power. Limes, minerals, some freshly baked bread notes. Long vein of taut acidity and sense of building power to finish. Drink between 2016 and 2022.